Ancient Stones - Borders - 004 Standing Stone, Kirkton Manor, Peebles. 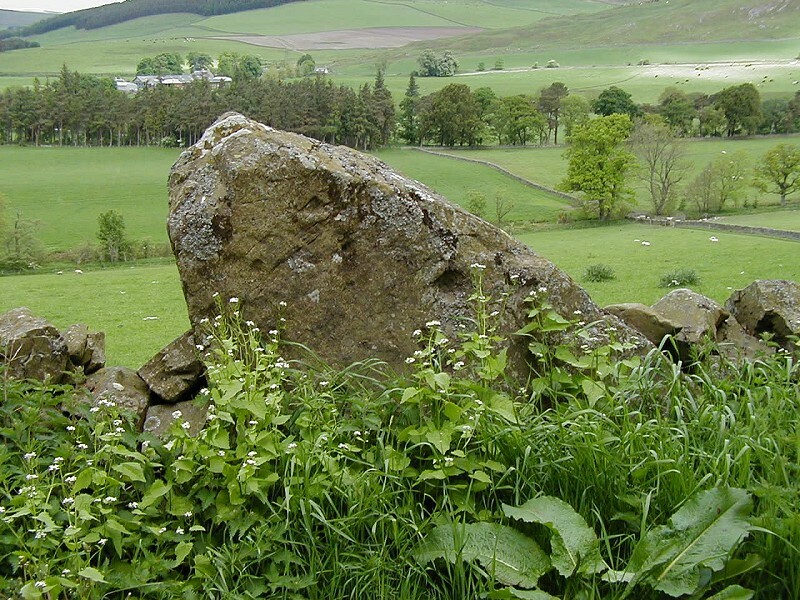 The standing stone that is built into the wall bordering the north west side of the public road halfway between Manor Bridge and Kirkton Manor is not in its original position and what is presumably the same stone is marked on Armstrong's map of 1775 about 90m further to the north west, placing it in the field towards the trees. The true size of the stone is best viewed from the field rather than the roadway. The stone measures 1.90m height and 1.50m x 0.53m at ground level. On both the north west and south east faces there are a number of natural hollows which have sometimes been mistaken for prehistoric cup-marks. The original position of this stone may be calculated at about NT 2262 3870. From the A72 Peebles to Glasgow road, take the minor road to Kirkton Manor. There is no parking nearby but the road is wide enough to park at the road side if care is taken. Alternative park in Manor village and walk along the road. The Source of Manor, a book by Lyne and Manor Youth Group includes the following two tales. The first relates that the Black Dwarf of Manor agreed to carry the stone from Peebles to Manor for a wager but grew tired and left it where it stands today. The second tale tells of a Giant who was passing through the area and stopped to take a stone out of his boot. The stone is also known locally as The Dwarf's Stone and local tradition also records that the stone was once an old woman turned to stone by the devil. I've cycled past this stone many times as it stands along one of my favourite cycle routes up Manor Valley and rarely have I failed to stop and wonder just what it's original purpose was. The stone is not in it's original position, some 90m to the north west, in the field towards the River Tweed but whether it stood there erect or lay in a prone position is not known. The original position would have placed the stone nearer to Arter Brae and Arter Brae Wood with an interesting point being that "Arter" is a corruption of Arthur. Possibly another connection with King Arthur? There are also a number of ancient sites near by, including two hill forts along Cademuir Ridge to the south east. The nearest standing stones are only 2 miles away at Sheriffmuir. There may be a connection but this has again been lost in time.